CALA - John Of Tonawanda, NY. Entered into rest November 26, 2018, at age 88. Beloved husband of 64 years to Dorine (nee Pietz) Cala; devoted father of Dorine (Donald) Saj, the late John C. Cala, and the late Vincent J. Cala; cherished Grampa of Kristin (Jason) Gigliotti, Nicole (Sonny) Granger, Jaclyn (Adam) Cole, Andrea (Craig) Skierczynski, Sonnie (Josh) Lis, Christopher Cala, Kelli Cala, and Emily Darnell; adored Papa of Gianna, Ava, Cali, Carmina, Savannah, Stella, Emma, Lily, and Cecelia; loving son of the late Vincent and Mary Cala; predeceased by seven siblings; also survived by many loving nieces and nephews. Relatives and friends may visit the LOMBARDO FUNERAL HOME (Northtowns Chapel), 885 Niagara Falls Blvd., near Eggert/Sheridan Dr., on Friday from 5-8 PM. Funeral Service will immediately follow. 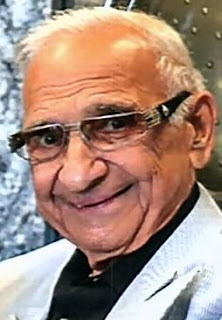 John was a veteran of the U.S. Marine Corps and was the owner of Giovanni’s Hair Fashions for 55 years.